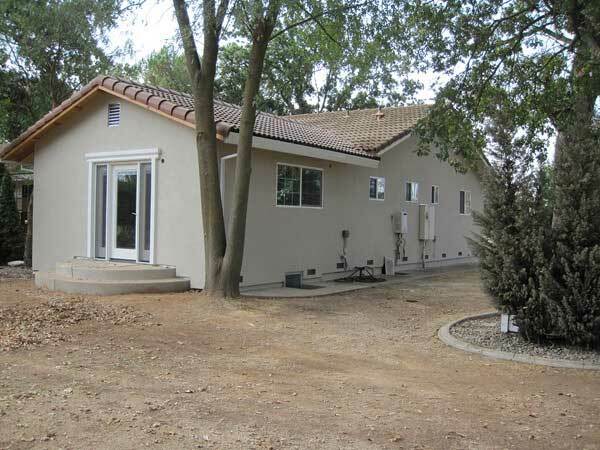 We are currently in progress on a complete remodel in East Sacramento that will include- removing walls in the kitchen to open up to the dining room, Complete kitchen remodel, 3 bath remodels,new master suite, new hardwood throughout, New windows, exterior doors, resurface the stucco on the rear and new cement fiber siding in the Front Elevation. Wow, I got tired just typing all that,....Photos coming soon! This project consisted of removing the existing HVAC from the roof top and installing a new super energy efficient unit in the attic complete with all new ductwork. We also installed new composition shingle roofing and did a bit of a kitchen makeover which consisted of replacing some cabinets, removing 4 walls and installing beams as needed for bearing. We removed a masonry fireplace between the kitchen and living room to open the 2 rooms to each other. 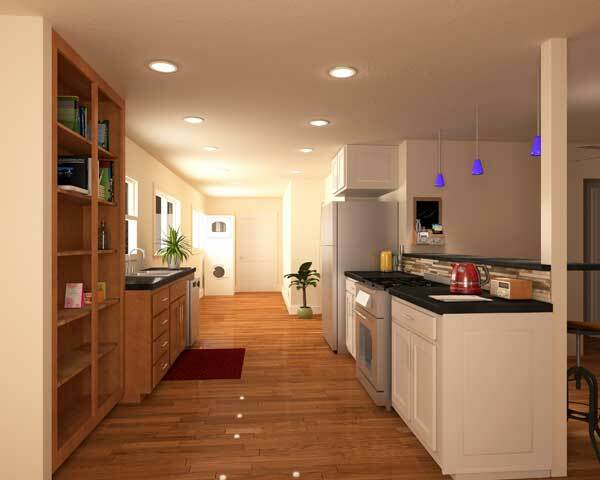 Phase II will be a little later and then the kitchen will be complete.Pre-Construction Rendering by Hiline Builders Inc. Phase I of This project consists of a 204² addition to enable a Master Bath and Master Bedroom enlargement. In this case the clients just wanted us to shell in the structure and they will be providing the finishes themselves. We removed the lap siding from the existing house and replaced it with an Acrylic smooth stucco finish. We also brought their previous garage conversion up to code to enable them to get an "after the fact" permit. Phase II will be a new detached 2 car garage. Already permitted and the foundation has been poured. 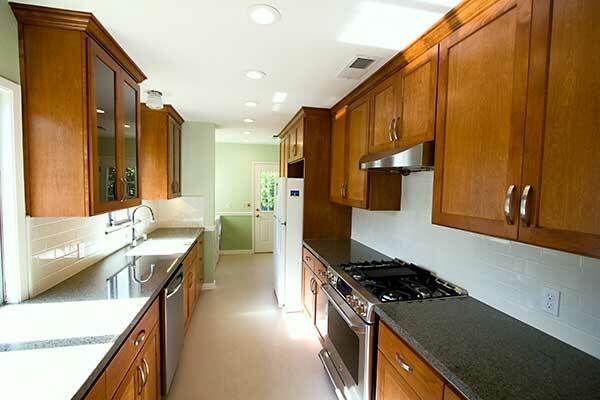 We recently renovated this East Sac Bungalow galley kitchen including new flooring, paint, shaker cabinets, plumbing fixtures, electrical appliances, granite counter tops and a subway tile backsplash. The Owners were a bit nervous about completing this project on time for their annual party in the first week in November. We completed this one 2 weeks ahead of schedule and almost $2,000 under budget. 7/16/2012- This project is a Hiline Builders Design only with the work being done by others. Coincidentally this is a house that one of my best friends lived in in high school. We used to hang out there quite a bit. Back then, the guest house was sort of a bunk house consisting of 2 bedrooms for the boys in the family. The current owner, also a high school classmate, purchased the home on 1 acre as an investment property. Among other things he'll be expanding the guest house to accommodate a new kitchen and bathroom to make it a fully functional accessory dwelling. Plans are completed and the permit submittal process has started. This master bath is currently divided into two rooms. A dressing area with a closet, and a full bath. 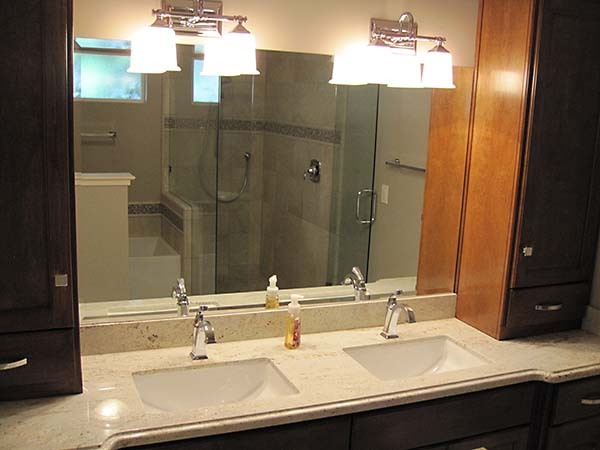 This design calls for removing the dividing wall to create a larger bathroom complete with a new whirlpool tub, tile shower with glass enclosure, new cabinets, lighting, window, and a double vanity sink. 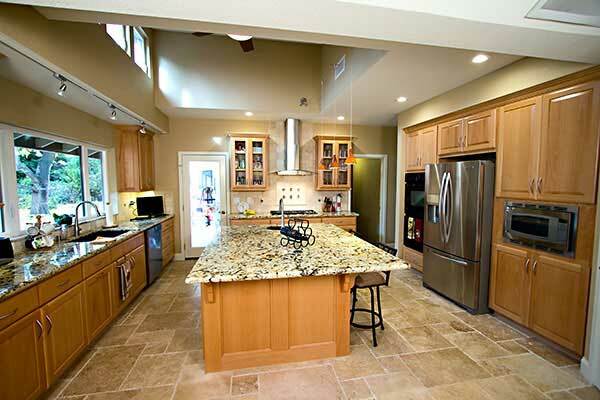 The need for natural light in the kitchen was the main motivation for this project. The scope was slightly scaled back to meet the budget. A full kitchen gut/remodel as well as a 170 sq ft. Office addition. We removed the wall between the kitchen and living room to open up a huge space which is perfect for social gatherings. The 8' ceiling was removed and a shed dormer added with windows above to bring in more light. We also increased the size of the existing kitchen window.This kitchen was finished off with new custom beechwood cabinets with granite counter tops and a tumbled stone backsplash. A garden alcove at the front of the house made for a perfect opportunity for a 170 sq. ft. office addition. 3 of the 4 walls were already in place as well as the roof structure over the area. Added square footage with minimal expense.